279 Beacon is located on the south side of Beacon, between Dartmouth and Exeter, with 277 Beacon to the east and 281 Beacon to the west. 279 Beacon was designed by Peabody and Stearns, architects, and built in 1881 for merchant, cotton manufacturer, and real estate developer Charles William Freeland, for speculative sale, one of six contiguous houses built in the same style: 271-273-275-277 Beacon built ca. 1876 and 279-281 Beacon built in 1881. 271-277 Beacon form a symmetrical group, with the bays of 271-273 Beacon on the west side of each house, and the bays of 275-277 Beacon on the east side of each house. Both 279-281 Beacon have bays on the east side of the house. The original building permit application for 271 Beacon has not been located. The building permit applications for 273 Beacon and for 275-277 Beacon, submitted in 1876, do not indicate the name of the architect. However, the permit applications for 279-281 Beacon, originally submitted in 1877, abandoned, and re-submitted in 1881, indicate that Peabody and Stearns was the architect of these houses, and it is reasonable to assume the earlier four – which are of the same design — also were designed by them (in his Houses of Boston’s Back Bay, Bainbridge Bunting attributes all six houses to Peabody and Stearns). Click here for an index to the deeds for 279 Beacon. Charles W. Freeland is shown as the owner of 279-281 Beacon on the original building permit application for the two houses, dated March 15, 1877. This application was abandoned, and he filed a new application on April 14, 1881. He died in December of 1883. 279 Beacon was not listed in the 1881-1884 Blue Books. On June 11, 1884, 279 Beacon was purchased from Charles Freeland’s estate by Dr. Robert Amory. He was a widower and previously lived in the Longwood district of Brookline, where his wife, Marianne Appleton (Lawrence) Amory, died in May of 1882. In September of 1884 he married again, to Katherine Leighton Crehore, and they made 279 Beacon their home. They also maintained a home, The Eyrie, in Bar Harbor. Robert Amory was a physician and professor physiology at Harvard. He retired in 1887 and became general manager of the American Electric Manufacturing Company. He also served as President of the Brookline Gas Company until September of 1888. By 1910, Robert Amory’s unmarried brother, Frederic Amory, was living with them at 279 Beacon. He was treasurer of a cotton mill. Robert Amory died in August of 1910. Katharine Amory continued to live at 279 Beacon, joined by her brother-in-law, Frederic Amory, and her children: Robert Amory, Jr., Mary Copley Amory, Katharine Leighton Amory, and Margery (Margot) Sullivan Amory. Robert Amory, Jr., married in September of 1910 to Leonore Cobb and moved to The Stratford apartments at 31 Massachusetts Avenue. Katharine Amory married in April of 1914 to James Ripley Hooper, Jr., and moved to 41 Pilgrim. Katharine (Crehore) Amory died in September of 1920. Frederic Amory and his nieces, Mary Copley Amory and Margery (Margot) Sullivan Amory, continued to live at 279 Beacon. Mary Amory married in March of 1922 to Arnold Welles Hunnewell. 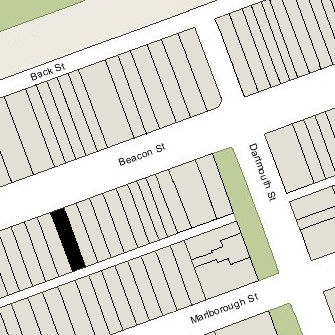 They moved to 179 Beacon, and Frederic Amory and Margery Amory moved to 241 Marlborough. On July 17, 1922, 279 Beacon was purchased from the Amory family by Katharine Bradlee (Crowninshield) Davis, the wife of Dr. Lincoln Davis, a physician and surgeon. They previously had lived at 217 Beacon. They also maintained a home, Big House, on Peach’s Point in Marblehead. Katharine Davis died in 1935. Lincoln Davis continued to live at 279 Beacon until about 1940. On September 6, 1940, 279 Beacon was purchased from Lincoln Davis by real estate dealers Warren-Stevens, Inc., and one week later, on September 12, 1940, it was acquired from them by Mary A. (Brown) Sanderson, the widow of Charles Francis Warren Sanderson. Mary Sanderson subsequently applied for a lodging house license and in November of 1940 was advised by the Building Department of the need for proper egress and approval of the necessary change in use before the property could be used for that purpose. In March of 1942, she filed an application to convert the property from a single-family dwelling into a lodging house. The application was abandoned. Mary Sanderson remarried in October of 1943, to Robert Willson of New York City, where they lived after their marriage. In December of 1943, she filed again for (and subsequently received) approval to convert the property into a lodging house. On July 18, 1947, 279 Beacon was acquired from Mary A. Willson by Mrs. Edna Mae (Reynolds) Candage Lovejoy Walsh Grant. She was the former wife of Henry (Harry) Wells Candage, the widow of Everett John Lovejoy and Dr. William Martin Walsh, and the former wife of Wallace Edwin Grant. She lived in Reading, and later would live at 470 Beacon. On March 11, 1948, 279 Beacon was acquired from Edna Grant by Herman Curtis Hazlett, a machinist, and his wife, Lexie Winsome (Miller) Hazlett, a nurse. They previously had lived in Watertown. They operated 279 Beacon as a lodging house. In June of 1949, they acquired 291 Beacon, which they also operated as a lodging house. They continued to live at 279 Beacon in 1954, but moved that year to 174 Marlborough, where Herman Curtis Hazlett died in March of 1955. On October 13, 1955, 279 Beacon was acquired by John Jacques Beaubien and James Sutherland Ambrose. They lived there and operated it as a lodging house. John Beaubien previously had lived in Vermont. They continued to live at 279 Beacon until 1957, when they moved to 271 Beacon. On May 1, 1957, 279 Beacon was acquired from John Beaubien and James Ambrose by Barnett Feldstein, a textile company executive, and his wife, Edith (Martin) Feldstein. They lived in Newton. They continued to operate 279 Beacon as a lodging house. On December 1, 1961, 279 Beacon was acquired from the Feldsteins by John H. Ayvasian, Jr., Nubar J. Dinjian, and George Najarian, trustees of the Penwood Realty Trust. In October of 1963, they acquired 281 Beacon. In January of 1962, Penwood Realty applied for (and subsequently received) permission to convert 279 Beacon from a “guest house” into ten apartments. It similarly remodeled 281 Beacon the next year. On April 7, 1969, Penwood Realty transferred 279 Beacon and 281 Beacon to Marguerite (Moranian) Dinjian, wife of Nubar Dinjian. On February 9, 1979, 279 Beacon and 281 Beacon were acquired from Marguerite Dinjian by Malcolm MacPhail and Peter A. Mead, trustees of the 279-281 Beacon Street Realty Trust. 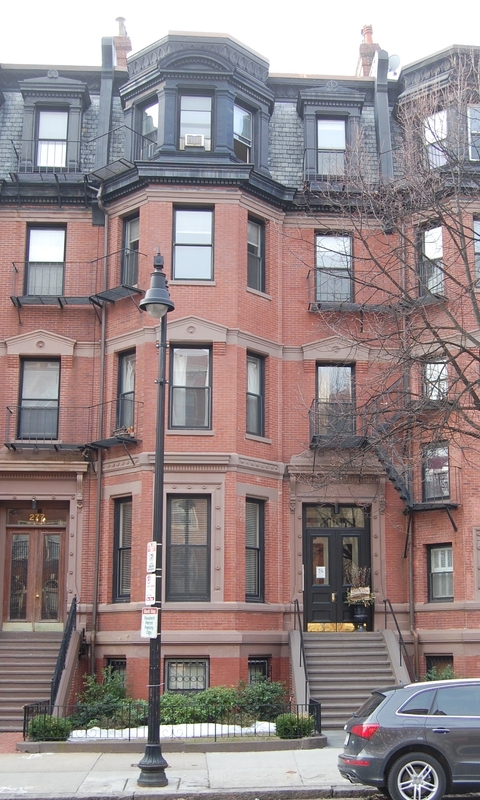 On June 8, 1979, they converted the properties into nineteen condominium units, nine at 279 Beacon and ten at 281 Beacon, the 279-281 Beacon Street Condominium.